Meals don't have to be bland and boring just because you can't put cheese sauce on everything. Prepare to mince! When you're trying to lean out, meals can get pretty bland. No high-calorie condiments or sauces, no cheese toppings or butter. But when the going gets tough, the tough get garlic! Not only does this ancient member of the lily family taste great, it also provides excellent health benefits. Garlic offers a good dose of manganese, vitamin B-6, vitamin C, selenium, and dietary fiber. Best of all, it adds a great deal of flavor without adding many calories. The following recipes call for strong doses of garlic to help you capitalize on all this miracle plant has to offer. Just keep plenty of breath mints on hand. Shrimp is one of the best protein sources you can include in your diet for fat loss; it's low in calories and nearly fat-free. Couple that with brown rice and you have a perfect post-workout meal to support speedy recovery. Baking in foil is an excellent way to prepare fish because the foil traps the delicate flavors. While grilling can also be a great option, foil-prepared dishes tend to pack in more overall flavor. This low-calorie tilapia recipe is also a good source of lean protein. Serve this fish with vegetables and a side of carbohydrates. This cauliflower soup is delicious and loaded with nutrition. Prepare a big batch and serve before your main course. People who start their meal with soups tend to consume fewer calories overall, which might help you shed a few pounds. Guacamole is an excellent side dish for any meal. It's loaded with healthy fats, rich in fiber, and doesn't contain any preservatives or processed ingredients—as long as you make it yourself, that is. 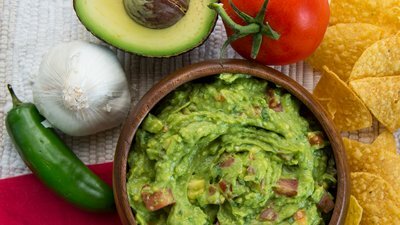 By preparing your own guacamole, you control what goes into it. Up the flavor even more by adding a good dose of garlic. The following recipe does just that. It'll also give you a great shot of vitamin E to keep your skin, hair, and nails looking their best. Serve this crowd-pleaser with chicken or as a dip for raw veggies instead of chips. Green vegetables are a must-have for any diet. They're low in calories, rich in vitamins, and loaded with antioxidants. With this delicious recipe, you'll look forward to eating them all. Serve these greens as a side dish for your main meal.